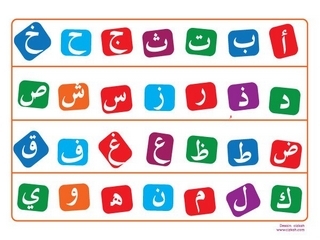 The Arabic Script And Pronunciation | Hannay Gamal '+g+"
The Arabic alphabet consists of 28 letters representing consonants. In addition there are three vowel signs which are used in writing both short and long vowels. Moreover, there are various other orthographic signs that are explained in the following chapters. The 28 letters are written from right to left. When writing words, the letters are connected (joined) together from both sides, except in the case of six letters, which can only be joined from the right side. These letters are numbered 1, 8, 9, 10, 11 and 27 in the table below and are marked with an asterisk (*). It is important to remember that these letters cannot be connected to the following letter (i.e. on their left side). Most of the letters are written in slightly different forms depending on their location in the word: initially, medially, finally or standing alone. There are no capital letters. above each letter is presented as it appears in different positions in connected writing when using a computer or as written by hand. 2. Ba ب /b/ A voiced bilabial stop as the /b/ in English ‘habit’. 3. Ta ت /t/ An unaspirated voiceless dental stop as the t in English ‘stop’. Never pronounced as American English tt as in ‘letter’. (b) In Lower Egypt (Cairo, Alexandria) it is pronounced as a voiced velar stop as the g in English ‘great’. (c) In North Africa and the Levant it is pronounced as a voiced palato-alveolar fricative /zˇ / as the s in English ‘pleasure’, and as j in French ‘jour’. like a loud whispering from the throat. It must be kept distinct from the sounds of خ /h (7) and .. ه /h/ (26). 7. kHa خ /h/ This consonant occurs in many languages. It is a voiceless postvelar (before or after /i/) or uvular (before or after /a/ or /u/) fricative, quite similar to the so-called ach-Laut in German ‘Nacht’ or Scottish ‘loch’ or the Spanish j in ‘mujer’, but in Arabic it has a stronger, rasping sound. 8. Da l د /d/ A voiced dental stop as the d in English ‘leader’. 9. Dza¯ l ذ /d/ A voiced interdental fricative, as the th in English ‘either’. 10. Ra¯ _ ر /r/ A voiced alveolar trill, which differs from English r in that it is a rolled sound or trill, pronounced as a rapid succession of flaps of the tongue, similar to Scottish r in ‘radical’ or Italian r in ‘parlare’ or Spanish rr in ‘perro’. 11. Zayn ز /z/ A voiced alveolar sibilant, as the z in English ‘gazelle’. 13. Shiın ش /sˇ/ A voiceless palato-alveolar sibilant as the sh in English ‘shave’, ‘push’. 16. Tha ط /t / An emphatic consonant, classified as a pharyngealized voiceless alveolar stop. It is the counterpart of ت /t/ (3), and similar to the sound /t/ at the beginning of the English word ‘tall’. 1 17. Dzha ظ /d/ An emphatic consonant, classified as a pharyngealized voiced interdental fricative. It is the emphatic counterpart of ذ /d, In some dialects it is pronounced as ض /d . In some other dialects it is pronounced as pharyngealized ز /z/ (11). 18. Ayn ع /_/ This consonant has no equivalent in European languages. It is defined as a voiced emphatic (pharyngealized) laryngeal fricative, which is pronounced by pressing the root of the tongue against the back wall of the pharynx (upper part of the throat) and letting the pressed air stream from the throat pass through the pharynx with some vibration. In a way it is the voiced counterpart of ح /h / It sounds as if you are swallowing your tongue or being strangled. similar to Parisian French r in ‘Paris’ and ‘rouge’ but with more scraping. 20. Fa ف /f/ A voiceless labiodental fricative as the f in English ‘fast’. 22. Ka¯ f ك /k/ An unaspirated voiceless velar stop as the k of English skate’. 2 2 3. Lam ل /l/ A voiced alveolar lateral as the l in English ‘let’. 24. Mım م /m/ A voiced bilabial nasal as the m in English ‘moon’. 25 Nun ن /n/ A voiced alveolar nasal as the n in English ‘nine’. 26Ha ه ) /h/ A voiceless glottal fricative as the h in English head’. 27Wa¯w و /w/ A voiced bilabial semivowel, as the w in English ‘well’.